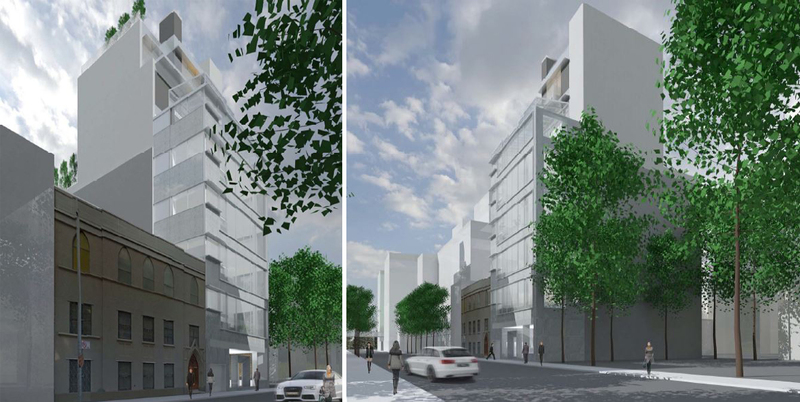 Work has begun on on Six Sigma’s upcoming condo at 435 West 19th Street, and the head-to-toe renovation/addition of the 1924 building seems intent on housing all the most outrageous frills of recent West Chelsea builds under a single roof. Boutique design-and-build firm Six Sigma acquired the 20,000-square-foot office building, once home to the photography studios and sound-stages of CityStage, for $21 million in August 2014. According to the developer’s website, Pei Partnership, a firm founded by the sons of renowned Chinese architect I.M. Pei, is crafting the design. Pei Partnership, not to be confused with Pei Cobb Freed & Partners, was also the designers of The Centurion, the Midtown condo lavishly clad in a cascade of Burgundy limestone. More info and images in the post here. I would love to see the Chelsea Piers razed and relocated elsewhere. That would be amazing park space. Swooping stairs are reserved for the building's three penthouses. Renderings by Hayes Davidson. The website for Zaha Hadid's swooping condos along the High Line just transitioned from a staid teaser to a full site that showcases a handful of new renderings while touting everything from the building's finishes to its next-level amenities. (Sorry, no floorplans just yet.) The changeover signals the quiet sales launch of one of the most anticipated projects in the city. This doesn't mean it's time to hunker down and obsessively refresh StreetEasy; although the condos at 520 West 28th Street are officially up for grabs, their listings will be guarded by Corcoran Sunshine and doled out only to those who directly inquire. In other words, they're not private, but they're exclusive. Prices for the 39 apartments—or residences, in broker parlance—start at $4.95 million for a two-bedroom, two-and-a-half bathroom and top out at $50 million for the 6,391-square-foot triplex penthouse. The curvature of the building isn't exclusive to its facade; Hadid also handled the projects interiors, which are rendered as a seamless extension of its shell. Opalescent engineered paneled walls hide closets and conceal powder rooms. Support columns seamlessly flow into the 11-foot ceilings. Rounded floor-to-ceiling windowpanes allay every edge that the exterior may ostensibly have. There's hardly a right angle in the place. Of course the building's finishes equal its design. Boffi co-created the kitchens, which include white marble, high-gloss millwork, and Gaggenau appliances. Master bathrooms include Boffi-designed eco-wood vanities, built-in mirrors with integrated lighting, freestanding tubs by Teuco Guzzini, and Dornbracht fittings. Many bedrooms will have private terraces with doors that glide open at the touch of a button. The building's three penthouses boast private elevators, fireplaces, and rooftop terraces complete with outdoor kitchens. The $50 million triplex penthouse has a sculptural custom-designed staircase. Its amenities are as sumptuous. 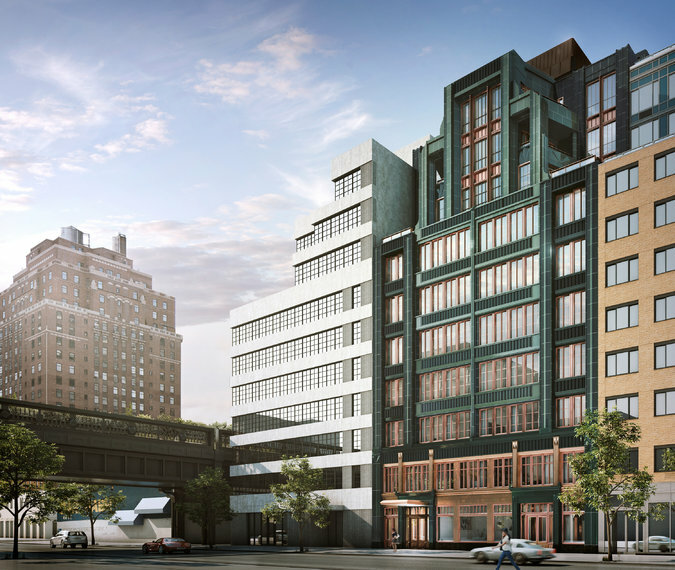 Residents at 520 West 28th Street will have access to the city's first private IMAX, and will be able to rent its hammam-style spa for private use. The building also has a 75-foot skylit saline swimming pool, a "wellness level" with a gym and cold-press juice bar (of course), a reservable lounge with an outdoor kitchen, and robot parking. Views from the L-shaped building will look toward Hudson Yards, the Hudson, and onto the High Line and a 2,500-square-foot planted sculpture deck with a work commissioned by developer Related Companies. The project won't be complete for another 14 to 16 months, and with the building's guarded listings it seems like views into the finished product will be as difficult to come by as those of its starchitect herself. The opalescent feature wall is designed to hide all hinges for closet and powder room doors. Master bedrooms will have en suite bathrooms and walk-in closets or dressing rooms with linen closets. The lobby will have a desk designed by Zaha Hadid. The building's facade is constructed with patinated metal. "We wanted to give it a sense of presence," Patrick Schumacher, Hadid's colleague for over 25 years, explained to Curbed at the building's launch event, "The use of bronze alludes to some kind of Art Deco experience in New York. And because of the metal of the High Line, there was this sense to contextualize the building into the mythical essence of New York." The shape of the building is symptomatic of the site's zoning restrictions. Hadid and Schumacher both addressed the challenges of the site's restrictions, and how the building's "chevron" and "curve" design was their cure. Curves are where balconies appear on the building. Chevrons are the opposite stretch where the window's end. 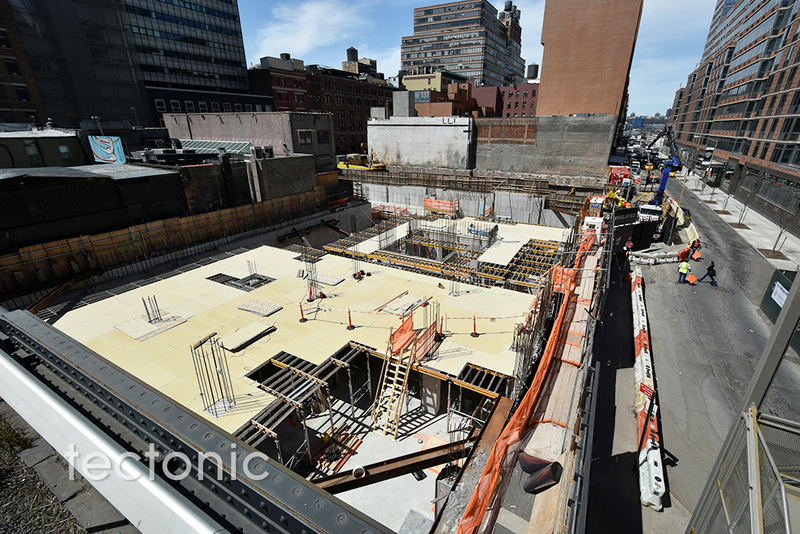 Construction shot by ILNY_ via the Curbed Flickr Pool. Most buildings by necessity are primarily 'rectilinear' : made up of strait lines, squares, triangles, and rectangles - with a few curves thrown in for visual interest. The cost for constructing a 'curvilinear' building with the morphing forms of this new Hadid design at 520 West is considerably higher: fortunately the visual excitement is also considerably better. Great looking new building that will make for a great new thread topic. Tall, slender and glassy might be the design choice du jour, but a condominium rising in West Chelsea harks back to an era when terra-cotta and copper signaled the pinnacle of luxury. Sales began this month at the Fitzroy, a condo at 514 West 24th Street between 10th and 11th Avenues, just steps from the High Line. With a lush green terra-cotta facade and oversize copper-clad windows, it is reminiscent of Art Deco. Designed by Roman and Williams — the husband-and-wife team known for their abundant use of Edison bulbs, vintage furniture and reclaimed wood — the building evokes a bygone age of grand manses. The Fitzroy’s prewar aesthetic extends to its interiors, too. In a break from the open-concept kitchen that is a standard feature in contemporary homes, Fitzroy kitchens are enclosed. Cabinets have a dark, nearly black rustic finish, set against a copper backsplash and hanging, schoolhouse-style pendant lights. Because the building is clad in terra cotta and not glass, it does not have the floor-to-ceiling, wraparound glass common in many new developments. The result: plenty of wall space to hang pictures. Roman and Williams has built a name around the aesthetic of nostalgia, infusing classic Americana into contemporary design. Even the company name — derived from the names of Mr. Alesch’s and Ms. Standefer’s maternal grandfathers — tips its hat to the past. Mr. Alesch draws his renderings by hand, a method that has fallen out of fashion. Most architects and designers use computers. The team designed the trendy Ace Hotel New York on West 29th Street and the interiors for the Standard, High Line. They have also designed a TriBeCa loft for Gwyneth Paltrow and three homes for Ben Stiller. The Fitzroy — the name is a nod to a road that once traversed Chelsea and Greenwich Village — is the company’s second ground-up residential condo. Billy Joel and the actor Gabriel Byrne both bought apartments in their first building, 211 Elizabeth Street. Sales began at that 15-unit development in 2008, just as the recession hit, and took more than two years to sell out, according to StreetEasy.com. 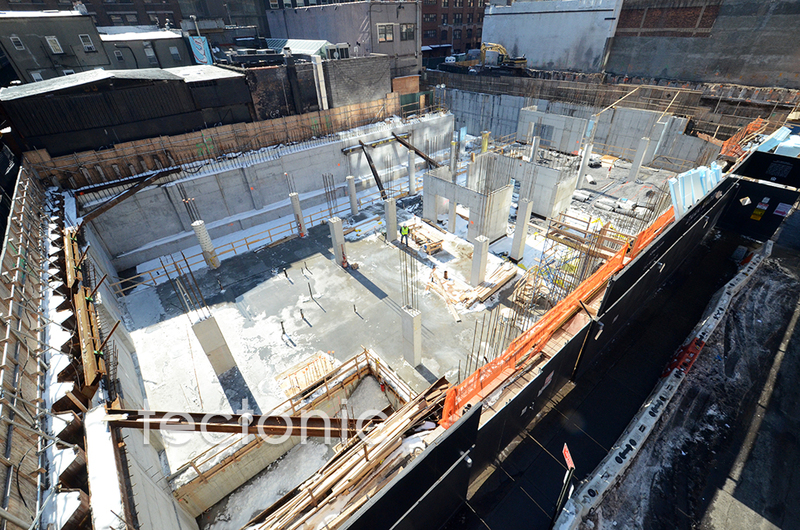 The 10-story Fitzroy, scheduled for completion in early 2017, will have 14 units, ranging from two- to five-bedrooms. Prices start at $5.2 million for a two-bedroom with a home office. The penthouse, one of the four full-floor apartments, has four bedrooms, a library, a breakfast room and a media room, along with more than 1,600 square feet of outdoor space that includes a summer kitchen. It is listed for about $20 million. Units have chevron floors throughout and some have fireplaces. Building amenities include a La Palestra-designed fitness center with a yoga studio and a dry sauna, a wine cellar, a children’s art studio and a rooftop lounge. Buyers will also find master baths clad in veined marble slab walls with a free-standing copper soaker tub — “it’s so yummy,” Ms. Standefer said. However, “someone that is looking for a glass bubble, this is not for them,” said Vickey Barron, an associate broker for Douglas Elliman, who is marketing the Fitzroy. Wow! 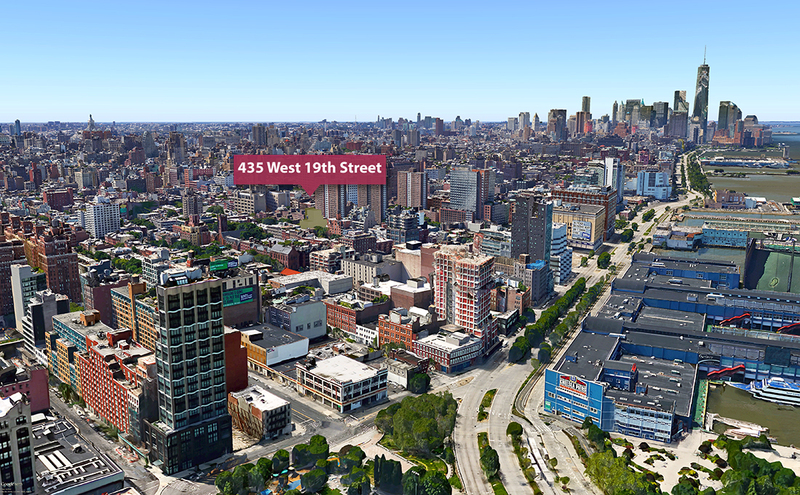 I can't wait for 1,400' of Zaha at 666 5th!